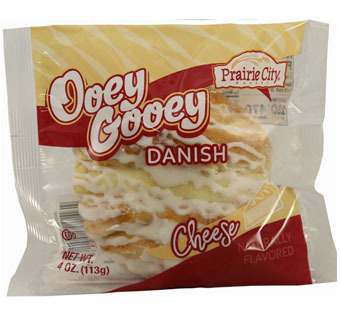 Everyone’s favorite, our individually wrapped Ooey Gooey Cheese Danish is made up of a moist, flaky dough―each hand twisted and braided—then layered with a full ounce of rich creamy Neufchatel cheese, and finally drizzled with sweet white icing. Our individually wrapped Ooey Gooey Danishes offer flaky layers of pastry dough with rich fillings and sweet icing. They’re available in two mouthwatering flavors: Cheese and Raspberry.